Donald Trump threatened Iran today in a tweet. 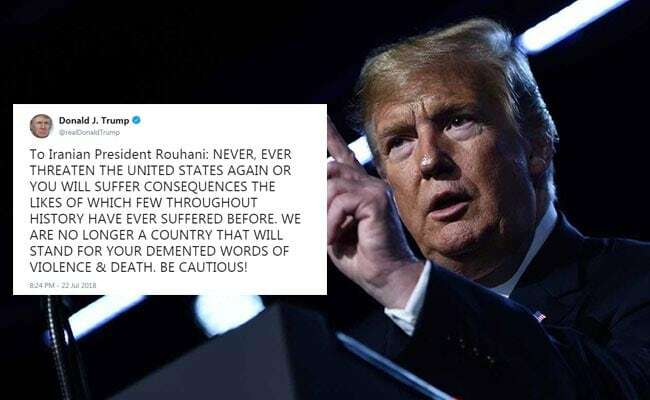 A few hours ago, US President Donald Trump hit back at comments made by Iran's president, warning him of consequences "the likes of which few throughout history have ever suffered." "NEVER, EVER THREATEN THE UNITED STATES AGAIN OR YOU WILL SUFFER CONSEQUENCES THE LIKES OF WHICH FEW THROUGHOUT HISTORY HAVE EVER SUFFERED BEFORE," Trump said on Twitter in a direct message to President Hassan Rouhani, who earlier Sunday warned Trump not to "play with the lion's tail," saying that conflict with Iran would be the "mother of all wars". The explosive tweet, typed out in all capitals, met with alarm as well as shock on Twitter, where Mr Trump has over 53 million followers. To The Cat: NEVER, EVER THREATEN THE HOUSEPLANT AGAIN OR YOU WILL SUFFER CONSEQUENCES THE LIKES OF WHICH FEW THROUGHOUT HISTORY HAVE EVER SUFFERED BEFORE. WE ARE NO LONGER A HOUSEHOLD THAT WILL STAND FOR YOUR NIBBLING WAYS OF VIOLENCE & DEATH. BE CAUTIOUS! To my kids: NEVER, EVER THREATEN UR PARENTS AGAIN OR U WILL SUFFER CONSEQUENCES THE LIKES OF WHICH FEW BABIES THROUGHOUT HISTORY HAVE EVER SUFFERED BEFORE. WE ARE NO LONGER PARENTS THAT WILL STAND FOR UR DEMENTED WORDS OF VIOLENCE & DEATH. BE CAUTIOUS! To Laundry: NEVER, EVER THREATEN THAT YOU'RE EASIER TO DO THAN DISHES AGAIN OR YOU WILL SUFFER CONSEQUENCES THE LIKES OF WHICH FEW THROUGHOUT HISTORY HAVE EVER SUFFERED BEFORE. WE ALL KNOW YOU DON'T HAVE TO FOLD DISHES. BE CAUTIOUS! NEVER, EVER THREATEN MY CHRISTIAN MINECRAFT SERVER AGAIN OR YOU WILL SUFFER CONSEQUENCES THE LIKES OF WHICH FEW THROUGHOUT HISTORY HAVE EVER SUFFERED BEFORE. WE ARE NO LONGER A SERVER THAT WILL STAND FOR YOUR DEMENTED WORDS OF VIOLENCE & DEATH. BE CAUTIOUS! This, of course, is not the first time that the US President's tweet has elicited jokes and memes on the micro blogging website. In January this year, jokes poured in when Mr Trump, in a series of tweets, declared himself a "very stable genius."